In this the fourth and last instalment of my garden in mid-April, I will focus on the roots and shoots I have in my patch this autumn / winter growing season. I fell in love with the parsnip when living in Blighty. They were a different vegetable in Britain sweet and tender and we ate them regularly but back in Australia I didn't find them as appealing. This is the very first time I am attempting parsnips. I never wanted to try when I was living in Sydney believing that a good frost was probably necessary to really make them deliciously sweet. So now we are living in the bush in a place that will definitely get a frost, I thought it was time to take the plunge and try my hand. 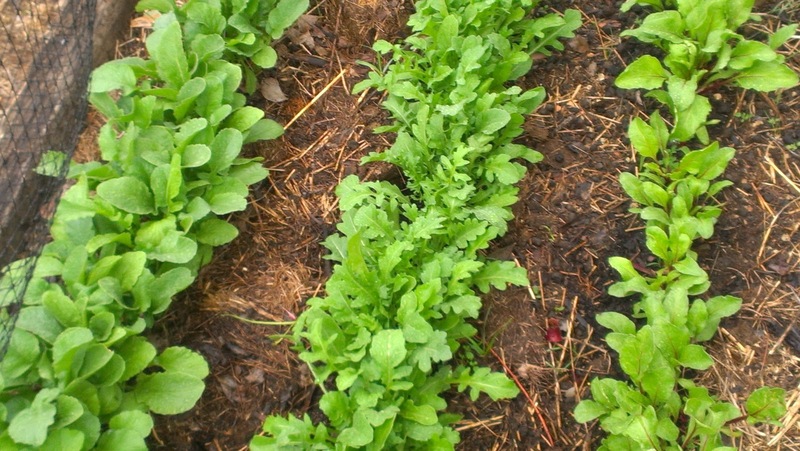 I am trying Hollow Crown from seed and have had no trouble in raising two rows. They seem to be growing well at least above the ground, but I suspect that my soil isn't good enough yet, or deep enough to get a great result. Still I am happy with their progress so far. When there is a little more room in the patch, I will be putting another row or two in. I love beetroot. I love the plant and love the root and eat it pickled, baked, boiled, grated and I find them so easy to grow. This year I have had more difficulty than usual. 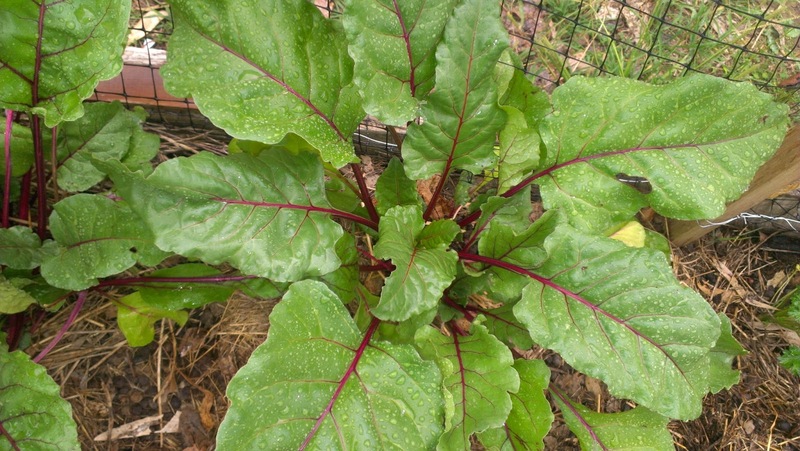 You see it seems that Wallabies love beetroot too and as a result they grazed off two of my plantings of beetroot. The plants miraculously survived and I am now gradually pulling the roots that developed. 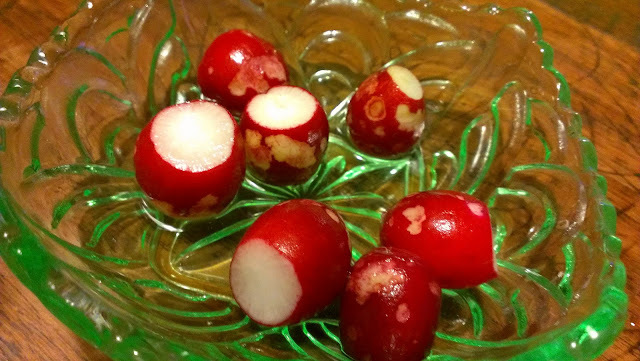 Radish were another favourite of the Wallaby and over summer we had hardly any of the crop. With the Wallaby excluded now I have a row that is being picked and grazed on by us and some other creature why is taking off some of the red skin making them a bit spotty. Yes, I know, not really a root more a swollen leaf base, but not sure where else to put it. 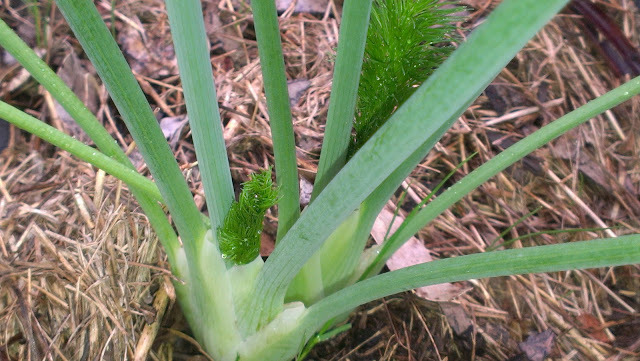 Not everyone's favourite, I have grown fennel for many years now and love them best from the garden. I probably have about 30 in the patch at three different stages. Here are two little fellas growing side by side - I obviously missed thinning it out. 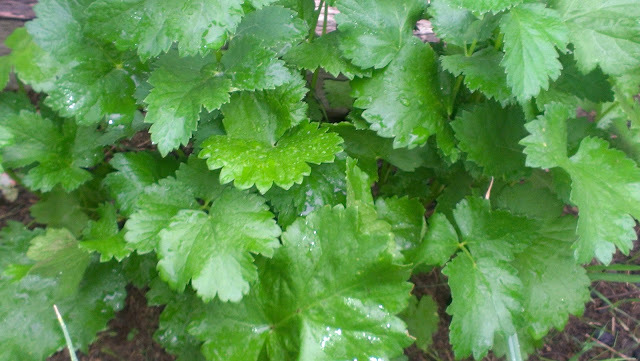 It's another of the things that are just so encouraging to grow because they are so simple. 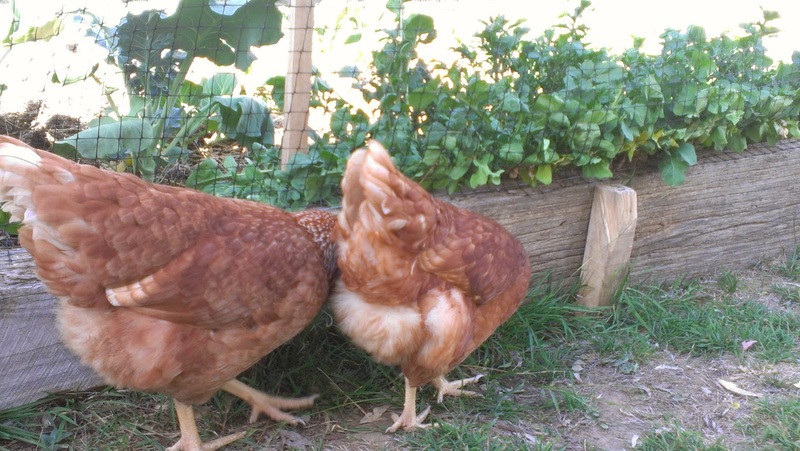 I have also discovered that the chooky girls like to graze on the rocket thru the veggie garden fence which is fine by me. Try as I might though, I couldn't get a photo with them actually pecking it, they must have found a bug in the grass. 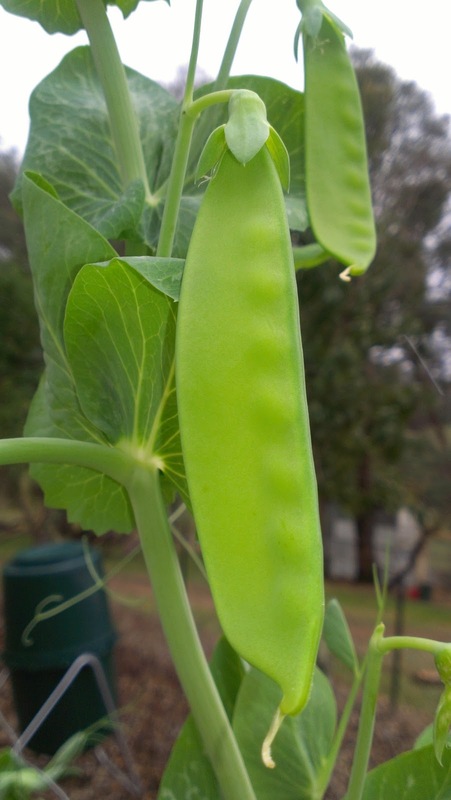 One of my all time favourite things to grow and eat, my snow peas this year are a little disappointing I suspect its the soil - it is still pretty average. Nonetheless I am getting a pick. I am trying these this year for the first time. I was inspired by Daphne's haul of sugar snaps and had to give them a go. They are only just starting to produce now - I have had a small pick which, when combined with the snow peas, was enough for greens for two for a meal - early days yet. So that's more or less my garden in mid-April. How is yours going? What a great snapshot of your April garden. Mine is very much in a between state, with the last of the summer crops - still a few tomatoes, eggplants and corn going, plus the melons and a few strawberries here and there - and the beginnings of winter crops - kale, cabbages, caulis, broccoli etc, plus beetroot, sweede, the garlic is just putting up green shoots, a few peas, the apples ripening. I would say though, grow carrots! Homegrown carrots are a world above shop bought any day. Its interesting how you can experience a food grown/cooked differently in another country and enjoy it. I have never really enjoyed parsnips probably because of the way they were cooked and served when I was a child. 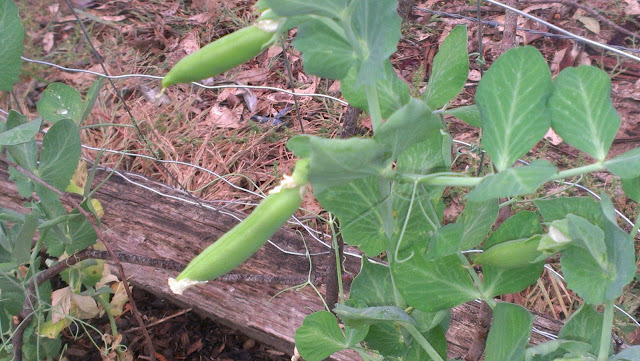 Its a veggie I really should try to grow and as we always have frost......Your Autumn garden is looking quite a picture, good luck with your sugar snap peas they are always a treat! I'm still waiting for rain before I can get into my garden.....Still I have planty of eggplants & sweet peppers.